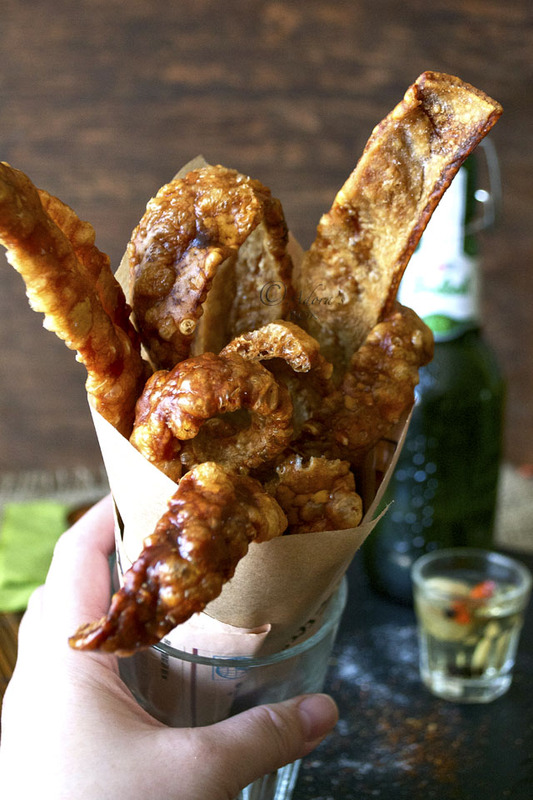 Who doesn't like chicharon (pork scratchings)? I know that east and west unite in their want to eat these babies. 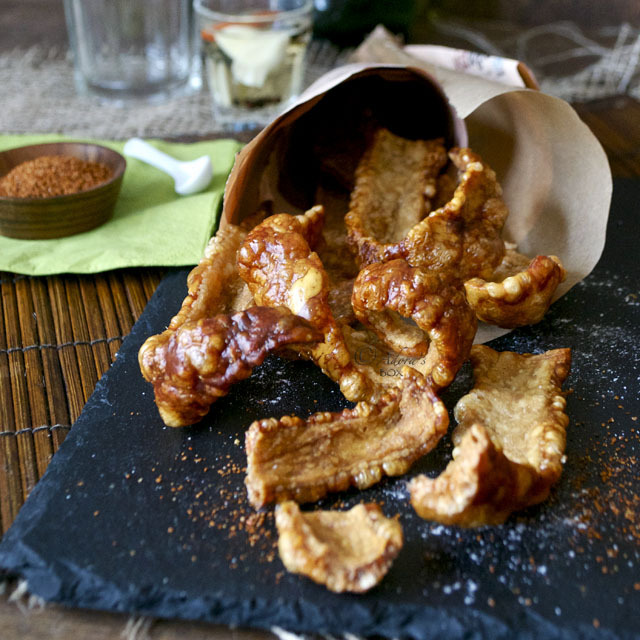 These munchables are a cross between chicharon (pork scratchings) and lechon (roast pork) crackling. 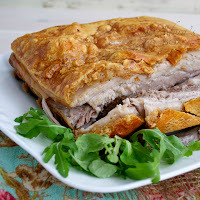 I always take the skin off my pork and throw them away until I came across this recipe from Black Girl Chef's Whites. 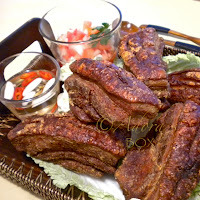 When I have extra oven space and pork skin, this is what I make. The traditional way of making chicharon is quite a laborious process. The skin has to be boiled until soft, then left in the sun until they are bone dry and hard. They are then deep fried until puffed. Only then will they be ready to eat. 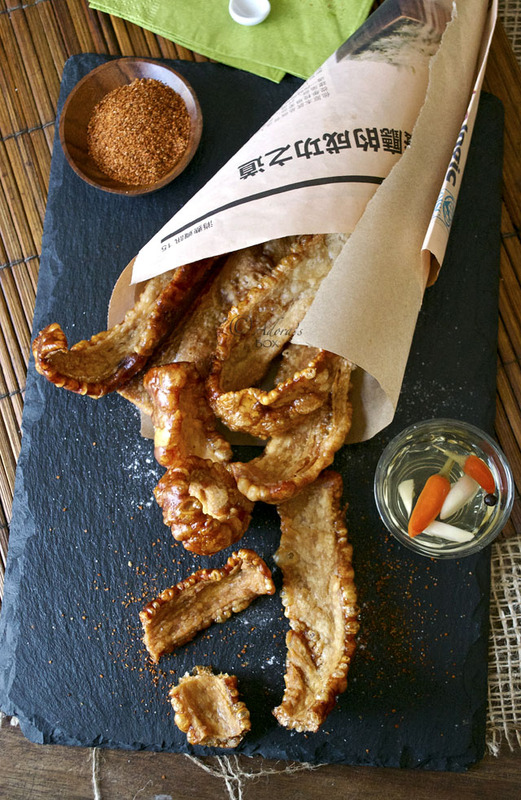 These pork scratchings are made in one step in the oven. There is no added fat. 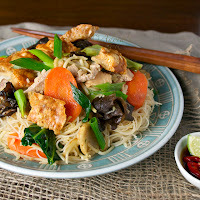 In fact what little fat there is is rendered in the cooking process. These are more like the cracklings from a pork roast rather than the puffed up bar food. Plain salt is nice enough but if you can add any spice mix you want. I always like a dip of vinegar with garlic and chillies with it. 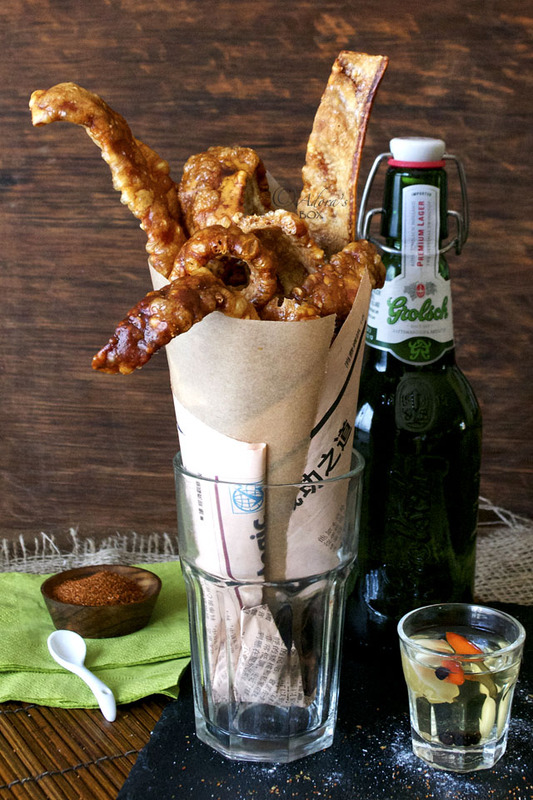 Make sure you have a lot of cold beer on hand when you make this. There is no given amounts for the ingredients because you can make as much or as little as you want. Preheat the oven to 300° F/150° C.
Make sure that your rinds are dry and free of hair. Cut them into strips, about 2" wide. Poke holes into the skin using the tip of a sharp knife. Grind a moderate amount of sea salt on each piece of rind. Leave them aside until the salt draws out the moisture from the skin. Pat dry with kitchen paper. Arrange them on a single layer on a lined baking pan. Bake for about 2-3 hours or until the skins are crisp and bubbly. 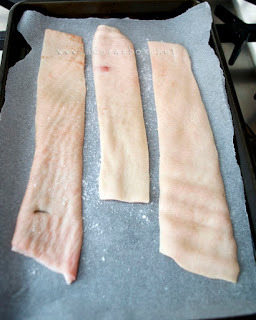 The cooking time will depend on the size of the skin. If you are cooking several trays, swap them so they'll cook evenly. Season with more salt, pepper and any seasonings you prefer. What a great idea.... Here in Miami, they leave more fat in the skin and some meat and then deep fry... These looks much more crispy though!! These look so good, never seen them made like this before. Oh Chicharons! What a guilty little pleasure. My mother use to make them and yes, I do remember it as being quite laborious. Thanks for taking out the labor part. These looks as good as those that took forever and then were fried. Love them! Have never eaten pork in my life and this is so new to me! But looks incredibly delicious and crisp. Wish this recipe worked. Followed your directions hoping for the best but they just don't bubble up that way. Tasty but tough, and not puffy at all. Sorry that it didn't work for you. There are a lot of reasons for a failed result. There's good pork skin and not. Also make sure that they are dry prior to baking. Poking with holes make them bubble up so do that well.